If your business is using ready-to-use facility cleaning solutions, cleaning solution concentrates, or a “top off” solution dispensing service, then it’s time to switch to UniFirst Cleaning Solution Dispensing Services to save big on the most commonly used cleaning supplies for your commercial facility. Compared to purchasing ready-to-use cleaning solutions, you could save 90% or more! And with our usage-based refill deliveries, you'll always have needed cleaning supplies on hand. Our wall mount dispenser system accurately dilutes and dispenses high performance concentrates with the push of a button. Unlike other less economical or lower quality dilution control services, ours is not a “top off” service. You get reliable, need-based delivery of your concentrated refill cartridges when you need them, and you only pay for what you use. With the UniFirst dilution control service, you'll never run out of the supplies you need to keep your entire facility clean. The money-saving secret to UniFirst's Cleaning Solution Dispensing Services is that you get perfectly diluted cleaning solutions, every time, at the single touch of a button. With ready-to-use cleaning supplies, 95% of your cost is for water content and elaborate packaging. And, unlike “free pour” concentrates, our service provides precise concentrate measurements so you never use more than is needed. Unlike other dilution systems, each of our patented concentrate refills come with a fresh, built-in metering tip to ensure precise, consistent dilution every time. This is superior to systems that have the metering tips installed inside the dispenser itself, where it gets clogged over time, negatively affecting your dilutions and your wallet. Less than 50 cents a bottle—just 1 of our Multi-Shine concentrates makes 88 quarts of ready-to-use glass and surface cleaner! See actual savings. It's easy to customize a cleaning solution and janitorial supply service for your operations. Visit our online commercial cleaning chemicals and dispensers collection in the UniFirst Facility Service Programs Catalog. Our system is safe and easy to operate. With one simple water hookup, you’ll be ready to mix perfectly diluted cleaning solutions with the simple touch of a button. Plus, color and number coding of concentrated refill cartridges make selecting the right cleaning solution for the right application a breeze. Labelled spray bottles are also available (shown left). Sealed refills and a closed delivery system reduce any risk of accidental spills. English/Spanish product labels, a wall mounted information guide, and safety data sheets (SDS) make staff training a snap. The UniFirst Heavy-Duty Degreaser Dispensing System complements the versatility of our overall Cleaning Solution Service and is ideal for shop degreasing at automotive dealerships, car/truck repair garages, industrial factories, warehouses, and other heavy soil environments. This advanced dilution control system is compact, easy to install, and features a “one button” design for simple operation. The quick connect water supply line creates suction to draw concentrate and automatically mixes in the proper water/concentrate cleaning ratio. 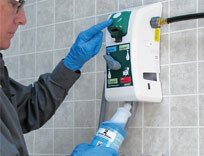 View the Cleaning Solution Dispensing Services Brochure. Access Product Safety Data Sheets (SDS). See the UniFirst Facility Service Programs Catalog for our complete line of facility service and cleaning products and services. services today. Call (800) 455-7654. If you're using “ready-to-use” facility cleaning solutions, hand mixing concentrates, or using a “top off” solution delivery service, you could save big on facility cleaning supplies by switching to UniFirst Cleaning Solution Dispensing Services. Browse our online catalog and choose from a wide selection of commercial cleaning chemicals and dispensers.